At this point, my beautiful wife and I have a nice little tradition for our anniversary. We’ll usually have a quiet morning, then hire a babysitter to head to the Morikami Museum and Japanese Gardens in Delray Beach (which, if you haven’t gone, is absolutely fantastic). From there, we head to Boca’s Barrel of Monks, maybe 10-15 minutes away, for a drink before heading home. It’s relaxed, it’s visually striking, and the couch by the front door is always free so we can sit and relax and enjoy being a couple. Members of their mug club The Brotherhood were there slinging tales at the bar and handing out a copious amount of the most heavently garlic rolls. Apparently it’s a rule with them; you order food, you order enough for everyone. She’s a bold, heavy, dark beer fan and always loves a snifter of Father Christmas (Belgian Strong Dark Ale, 10% ABV), which is one of her favorites. Loads of heavy malt character with a heavy dose of sweet, raisin character. There was also an undrcurrent of citrus in this year’s variation we both tasted and enjoyed. I always go for something new to me, so I had the Blood Orange Gose (Gose, 5.5% ABV, 14 IBU), a Gose with a large amount of tasty, slightly tart blood orange. Given the slightly salty nature of a gose, it was an excellent combination. The orange was just electric enough to perk up the light, wheaty malt an give it an extra kick, fueleled by the saltwater. 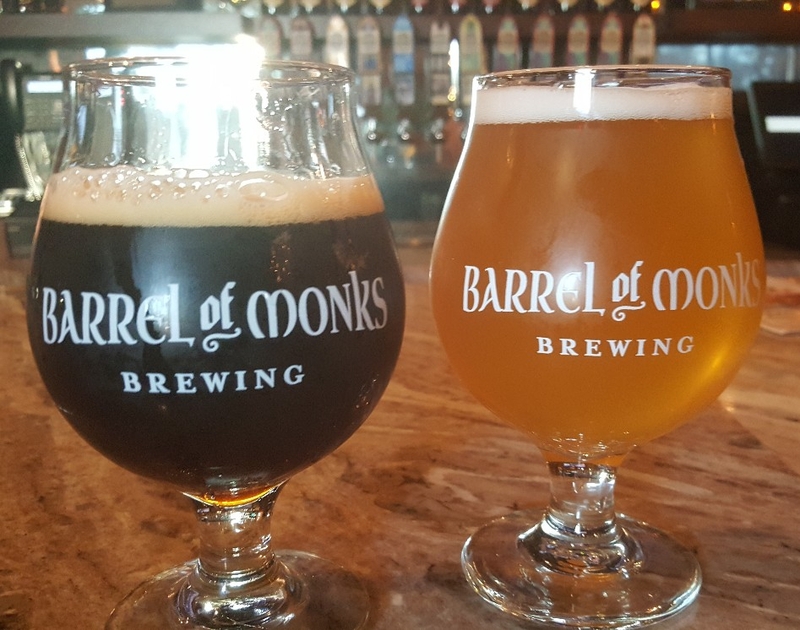 It’s a nice tradition we have, and Barrel of Monks is a great place to have it going. I can’t wait to continue it for many, many more years to come.